Brother CS5055PRW is a quality machine, the only problem is that there are better models from Brother itself at more or less the same price. 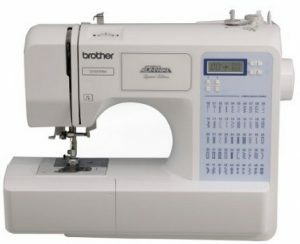 Brother project runway CS5055PRW comes with 50 built-in stitches. It has 25 years limited warranty as well. It is very easy to set up this machine, it won’t take more than 10 minutes. The instructions on the user manual are easy to follow. This sewing machine is sturdy and good looking. Bobbin winding and threading on this machines is very easy. The automatic needle threader saves the pain. You can easily select the stitches using the push buttons and you can view all the settings on the LCD screen. It is very easy to use this machine, especially for the beginners. The user interface is very good and it has a variety of stitches. The machine is incredibly quiet as well. Stitches come out perfect and straight. One difficulty I had with this machine was in getting the thread tension right. It won’t be an issue once you get the hang of it. It does a very good job with couple of layers of denim, but it struggles with more than 4 layers. Overall, Brother CS5055PRW is a very good beginners sewing machine. It has all the features a beginner want. A great addition, if you run a sewing class. It is also light enough to carry around. It is a very good sewing machine but I won’t recommend this one. It is not because it is a bad machine, it is just because you can get a better model from Brother with more features for the same price . The alternative model I am talking about is the Brother CE7070PRW (the price was exactly the same when I wrote this review). It has better features without any doubt. It has 70 built-in stitches, comes with a wide table and many more. So you will be better of buying Brother CE7070PRW or you can consider Brother CS6000i which features in our list of ‘Machines You Can Buy With Your Eyes Shut’. Both these machines come under the same price category.